Maps are available Worldwide. They are usually updated every Friday. 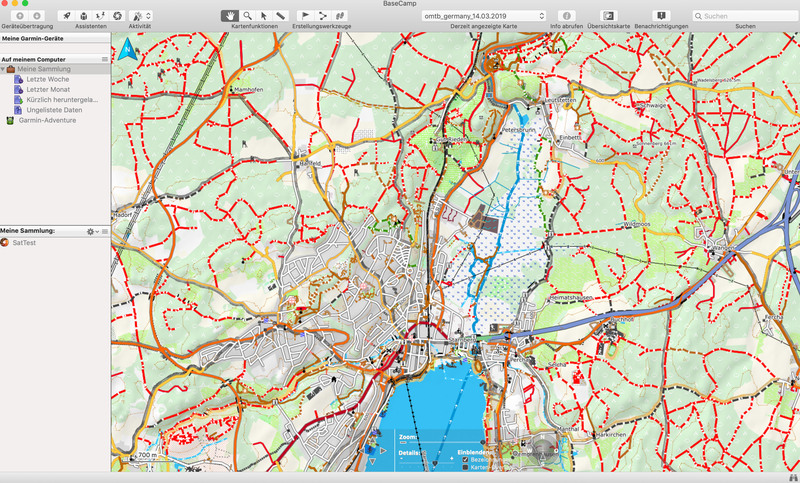 All maptiles are compiled with mkgmap using map data from openstreetmap.org & Contributors. You can use and edit the map data by visiting openstreetmap.org. Thanks to Geofabrik for providing the map data snapshots which I use to create the maps. Thanks to http://viewfinderpanoramas.org for the best DEM (contourlines) available on the net. -- For Copyrights please see the Installer or if you unextract the installer see the file copyright.txt. LIDAR data from open government data and other openly available sources - collected and converted to hgt format by - Sonny - https://data.opendataportal.at/dataset/dtm-austria This data is very very high quality and resolution - there is no better open data available according to my knowledge. SRTM 1" v3.0 - very rarely for some tiles missing in ALOS data - also only between N60° and S60°. Viewfinderpanormas 1" - then 3" - above N60° / below S60° as there is no SRTM data nor ALOS or LIDAR Data avialble. more exact info which data is used where - inside the copyright.txt files. For The Europe continent map, and all maps that have the contourlines as a separate download - please make sure to read the above linked tutorial (you additionally need to extract one folder and move it to the right location). Please use the latest Garmin Mac OSX Basecamp Version. Maps are not compatible with Basecamp v2 or older (as well with other old Garmin Mac OSx programs (e.g. Roadtrip)). Send Maps to GPS with Basecamp/Mapinstall: tutorials/send-maps-to-your-gps/mapsource/ I recommend to always send maps to an external data card and not internal memory. (this way if something goes wrong, or maps would be damaged you run less danger of wrecking your GPS). The address search is not working consistently. Most problems are due to inconsistent data structures in OSM address data. 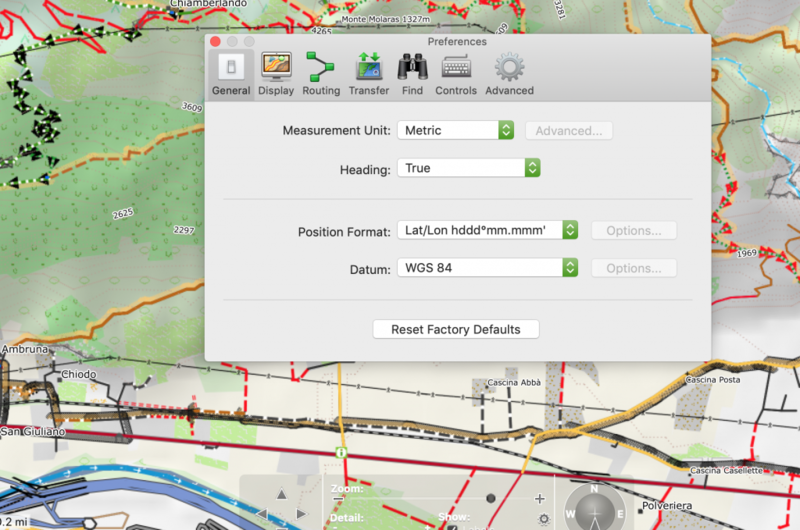 - Autorouting needs attributes like tracktype, bicycle routes, mtb:scale, sac_scale, mtb routes and others to work well. So keep care to enter those details into OSM. (not all are needed, but enough for me to guesstimate wheter a street is cyclefriendly/mtbriendly or not). - Non Connected ways and overlapping ways without node, this is the main problem and a problem of the underlaying map data - please check here: http://keepright.ipax.at/report_map.php Only check/enable: "almost Junctions" , "intersections without junctions" as well as "overlapping ways". This helps you to quickly spot the erros. You can then follow the link to Potlatch (or also JOSM is integrated for JOSM users) and quickly correct mistakes! Watch out not to connect ways that are not connected in reality (i.e. a way crosses another on a brigde, here no connecting node is the right solution). - If you use Windows 2000 you may need to install the "reg" command : Reg cmd at Microsoft. Batches are incompatible to earlier Windows versions. - Note sometimes sea is missing. This is not an issue, but currently not differently possible. It is usually a problem in OSM data. If you want to be notified by email on map updates please go to the frontpage and enter your email address in the subscribe field of the left sidebar. You only get an e-mail when there are changes besides a simple map data update. Map updates are usually every Thursday night / Friday morning. You can look at the server to see the date of map upload. To update the maps, simply overwrite the old data or use Mapinstall. While you can join maps of different countries, routing over the boundary is a bit shaky, and you will have one map overlaying the other with white background. As long as mkgmap cannot create randomly shaped overview maps (currently only rectangles), this problem is not solvable. There is however the possibility to download a Europe map, which will be updated every 4-6 weeks. If you install an openmtbmap and a VeloMap of the same country with contourlines as separate download (and Spain as well as Canary Islands), you should only send the contourlines once (meaning with either Openmtmbap or Velomap of the country). Else you GPS might not show the maps, or worse not even start until maps are deleted. Therefore: Install one map without conoturlines. E.g. install openmtbmap Europe with contourlines, but do not install the contourlines for Velomap Europe. you will need to download the "non unicode" version of the map instead. So get the map from the "non unicode openmtbmap" tab instead. Only maps of regions where several different scripts are used - are in unicode. If Latin is the predominant script - then of course no unicode map is offered. If your device can display Unicode maps - then of course get the standard version - meaning Unicode. And don't forget if you have problems unpacking the maps - .7z is a container, the actual compression I use is the very modern lzma2, most .7z archives however use the older lzma compression, therefore make your you use the latest The Unarchiver or keka or another program that can unpack lzma2! Upon several requests, I have decided to make available all openmtbmaps and velomaps available for download in Mac OSx gmap format for Basecamp. This saves you the hassle of converting them. All countries will however only be available for download for openmtbmap members. Austria is available as a download to everyone, so you can try it out. If you want to know the last update time, MD5 Checksum or exact filesize of a download - just look into the MD5 link that follows each download. Most countries, especially the popular ones, have the contourlines already integrated. However for several countries the contourlines are rather large (rule of thumb if contourlines have more data than the maps) and I integrate them, but you need to download them separately (once). This is due to a firmware bug that Garmin introduced as part of their efforts to cut down on people "pirating" their maps. However by doing that they also cut down on Unicode maps produced by mkgmap or even some of their old (legitimate) maps which are not running anymore on these devices. You will know that you need to use the Non Unicode map if on boot your GPS device tells you to "unlock maps". Why is the Europe Map in Unicode? Well for example in Greece and some Eastern Europe countries the script is Cyrillic not latin - and only Unicode maps can contain both scripts in one map. So the non unicode map will not correctly show labels in such countries. Use the country non unicode map instead. They are always in the predominant script of the country. Note1: if you install the non Unicode version of a map - you will overwrite the Unicode map. You can only have either or installed. Here only those countries are listed - where the standard download is Unicode. If you don't find a country here - look at the standard downloads. Contourlines are identical to Unicode maps. Note - if a country is not listed here - it means the normal map is non unicode anyhow. Only maps with (Unicode) behind the name are unicode. E.g. for Germany there is no need for a Unicode map - as only latin is used in Germany. Note - local language maps of: Sri-Lanka, Nepal and Cambodia are in latin1 - so the local language maps are not very useful. There is no ANSI Codepage available (besides Unicode) that would support the script/garmin units. Israel-Palestine map is in hebrew (so the Palestine area is not useful). Afghanistan codepage is for Dari - Pashto is not supported outside of Unicode. Hallo – wäre es möglich die Kartendaten im Download für Mac als TAR oder ZIP auszuliefern? Für 7z braucht man immer noch eine Stück software mehr um die Archive zu entpacken. Viele Grüße & Danke für die Karten. Nur ist die Kompression viel schlechter. Keka oder The Unarchiver oder einen anderen guten Entpacker installieren sollte doch kein Problem sein. Dass viele OS mit lzma im Datei Exlorer/Finder/Browser nichts anfangen können ist eh eine depperte geschichte – weil sowohl OSx als auch diverse Linux/Unix Systeme lzma selber nutzen (etwa linux kernel). Eine mögliche Erklärung für die Abstürze bei BaseCamp 4.8.3 ? Aus einer alten Gewohnheit heraus bediene ich mein MacBook Pro fast immer mit einer Magic Mouse 2 (Für alle „Nicht-Mac-User: deren Oberfläche reagiert auf unterschiedliche Streichbewegungen wie ein Trackpad…) von Apple und das Touch Track-Pad nur in Ausnahmefällen. deshalb habe ich auch nicht sofort gemerkt, dass durch unbeabsichtigtes verstärktes Zoomen Base-Camp „verabschiedet“ und mit Fehlermeldung zum Versenden wieder öffnen lässt. Das „Zoom-Verhalten“ resultiert daraus, dass beim unbeabsichtigten Streichen auf der Magic Mouse mit dem Finger die jeweilige gestartete Landkarte gezoomt wird und das „überfordert“ augenscheinlich Base Camp. Da ich einen solchen Absturz bei der Maus-Verwendung fast immer provozieren konnte, beim Benutzen des Track-Pad aber einwandfrei arbeiten konnte, habe ich wieder auf 4.6.3 umgestellt. Diese kleine Ausführung deshalb zur Info für „Maus-Anwender“. PS Das „Zoom-Phänomen“ erlebe ich z.B. auch bei Radroutenplanern, auch dort „frisst“ sich die Anwendung ab und an fest, deshalb benutze ich hier „gezwungenermaßen“ nur das Track-Pad. Schreib das mal unter forums.garmin.com als Fehlermeldung rein – evtl können die das nachvollziehen und reparieren. ich benutze ein MacBook Pro mit MacOS Mojave 10.14.3 und habe ebenfalls Basecamp 4.8.3 mit Mapinstall 4.3.1 installiert. Sowohl auf dem MacBook, als auch auf meinen eTrex 20x und eTrex 30x funktioniert alles einwandfrei! Kleines Hinweis für das Mac-Tutorial: Mapinstall muss direkt gestartet werden, es funktioniert nicht über das Basecamp-Menue. Hmm ja der Fehler dass karten senden nicht mehr auftaucht – ist irgendwie inzwischen Häufig. Ich muss dass mal hinzufügen. Ich habe grad mal auf MacOs 10.14 Basecamp 4.8.3 installiert, es enthält Mapinstall 4.3.1 (Beta). Ich hab jetzt 4 Reports zu 4.8.3/4.3.1 – es scheint alles okay zu sein (wenn du beim senden Abbrüche bekommst – dann bitte um Meldung – das war ja das Problem am Mac. Wobei es nur bei einigen Ländern – oder ab und zu auftrat). 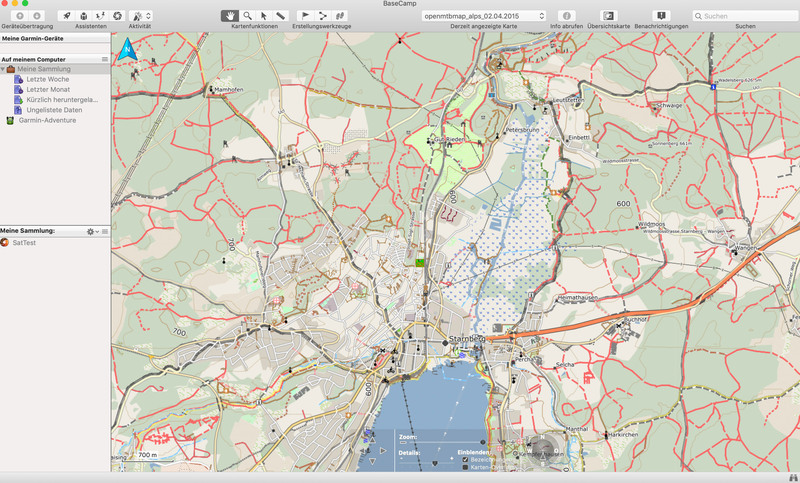 wieso sehen die neuen mtbmaps so grell bunt aus? und wieso ist die mtb_germany im vergleich zur mtb_alps so gestaucht/verzerrt? Ich habe einfach das Standard Layout von Desktop (trad) zu Wide geändert – da die meisten Leute das vor dem senden nicht geändert haben – und wide das meistbenutzte Layout auf GPS Geräten ist – das Desktop Layout ist am Gerät zu kontrastschwach. Evtl ändere ich das wieder wenn die gmapsupp.img Downloads verstärkt genutzt werden. Die Stauchung liegt an Basecamp – es wird immer zum Mittelpunkt der Karte zentriert – der ist bei den Alpen halt südlicher als bei der Deutschlandkarte. Bei der EU Kontinentkarte hast du dann krasse Stauchung. Das ganze ist über Umwege frei setzbar pro Karte. hallo felix – vielen dank fuer deine superschnelle antwort! verstehe. aber ich muss sagen (bin aber im gegensatz zu dir totaler laie) dass ich die alte voreinstellung zumindest auch auf meinen navis (edge 810 und fenix 5x plus) besser fand. momentan bleibe ich dann erst einmal bei der openfietsmap die finde ich auf rechner und navi am uebersichtlichsten. besonders da die spezialisten von garmin jetzt mit dem update (2017.30->2018.20) der auf der fenix vorinstallierten activeeu jetzt alles versaut haben und in vielen zoomstufen fast gar nichts mehr angezeigt wird egal ob man details auf hoch/standard/niedrig stellt?!? Mit der Fenix kenne ich mich nicht aus. Das alte Layout kannst du leicht haben – siehe Mac OSx Tutorial – oder noch einfacher bei den gmapsupp.img Downloads brauchst du nur im Terminal bash change_layout_mtbmap.sh aufrufen dann kannst du das Layout auswählen. dankeschoen 🙂 eine letzte kurze frage: wollte gerade nochmal was runterladen aber wieso sind die downloads (fast) immer so extrem langsam trotz member-login? ueberall auch bei openietsmap (ohne mitgliedschaft) geht es mit ca. 100 mbit – hier meistens gerade mal 10 mbit??? Eigentlich sollten die recht schnell sein, bist du sicher du meinst die Premium Downloads? Die Standard Karten der Server ist ab und an eher langsamer – mein eigener Server ist per 1000Mbit zugesichert angebunden – und auch nicht überlastet. Ich persönlich komme eigentlich immer auf das Limit meiner Verbindung (nur 75Mbit). (sind monatlich etwa 7-8TB Traffic – dass sollte auch zu Hauptzeiten bei 1Gigabit/s kein Problem sein (und die meisten Karten liegen auf einer NVME SSD – die läuft eh schnell genug). nein – ganz sicher – bin eingelogged und es ist extreeeem lahm. es geht nicht um eingeloggt oder nicht. Sondern die Quelle. Ist es https://openmtbmap.org oder https://ftp.gwdg.de ? Zweitere ist nicht unter meiner Kontrolle – und ab und zu übelastet. Alle kostenlos downloadbaren Karten liegen dort – egal ob du Premium Mitglied bist oder nicht. evtl ist das Pairing von deinem Provider sehr schlecht? Ich habe gerade von einem anderen Server aus zu beiden Quellen über 200Mbit/s erreicht – (keine Priorisierung – ganz normale die Links im Chrome abgerufen). ganz einfach der link den man bei deiner seite anklickt. und nein es liegt nicht an userem zugang da es ueber lte genauso schlechte downstreamraten ergibt. okay – sehr komisch. Ich habe sowohl von mir aus (Österreich) als auch von dem Server (Schweiz) immer hohe Raten. Und ja – dass ist eindeutig mein Server und nicht GWDG. kann man denn die neue karte parallel zur alten in basecamp installieren dann koennte man zwischen beiden hin und her schalten und eventuell sehen wo was neu ist? du kannst etwa die Kontinentkarte parallel zur alten Länderkarte installieren – oder Alpen zu Österreich. Selbes Land geht nicht. Oder Velomap und Openmtbmap (aber die Velomap hat halt weniger Details – aber schon fast alle Straßen/Wege außer halt sehr schwierige). danke uer deine ganze arbeit! hab mir vorhin (nach 4 jahren) die neuesten versionen der velo_alps und mtb_alps uer mac heruntergeladen. wo und wie kann ich am besten sehen wo hier in meinem gebiet verbesserungen in den karten erfolgt sind? Dazu kenne ich kein Tool. Generell ist in den letzten 4 Jahren aber bei OSM schon so einiges mehr eingetragen worden – und halt aktualisiert. I am trying to install non-Unicode Europe maps (I have a Garmin Fenix 5X) on a Mac OS High Sierra v10.13.6 with Basecamp v4.6.3 and MapInstall v.4.1.1. I have followed the instructions and can get as far as installing the maps to Basecamp via MapInstall from the unzipped mtbeurope_macosz.7z and mtbeuropefile.7z files. However I cannot unzip the Europe_contours.7z file using Unarchiver (v.4.0) (I also tried and failed using Keka to unzip the file) to add contours. Note, I previously installed non-Unicode Thailand maps with contour lines with no problems, following the Mac OSX instructions. Not sure what the problem is, please help. Make sure the europe_contours.7z has been successfully downloaded – I assume it’s only partly downloaded (check size, and if size really matches check the MD5 hash – It really cannot be matching else you would not face those problems). As you said the europe_contours.7z was not successfully downloaded on checking. Discovered this was due to my VPN service. Switching off the VPN and downloading the file was then successful. 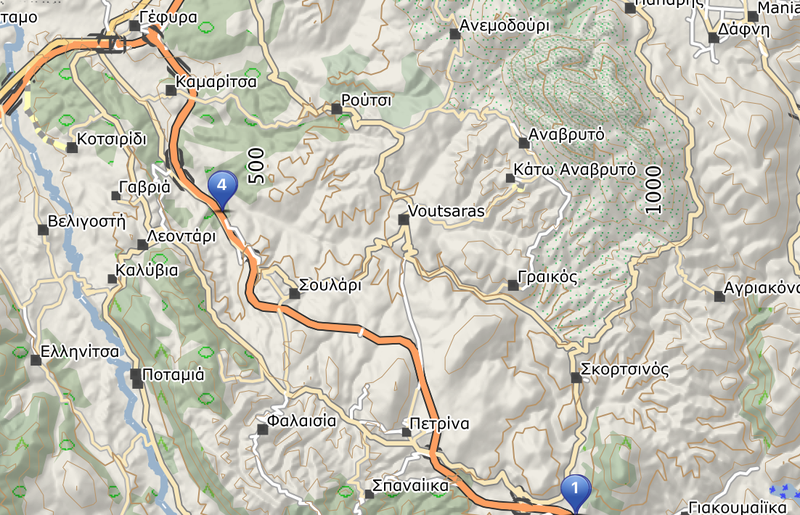 Die englische Griechenland-Map (omtb_greece_29.01.2019_UC_ENG) ist bei mir leider trotzdem in griechisch. Muss noch irgendetwas umgestellt werden? Danke. Die ist soweit in Englisch – wie Englisch in OSM existiert. Wenn du Latein Transkription willst – nimm die Non Unicode English. I thought of updating it, but note that the file I have just downloaded has the same name – so may I assume there are no changes – don’t want to mess around with my maps if not needed? Also, I see I have Basecamp 4.7.0…….I guess that’s a problem? Sorry, hat sich erledigt. Ich habe es gefunden. suche Mac OS_X Karte für Dubai. Unter was versteckt sie sich ? Hello! This may be an obvious answer, but how do I upload the contour data? I can install the mob map but the contour data is a n=bunch of folders and it is not clear what my next step is. Thanks for the assistance. Garmin 62s handheld unit being used. I can not use the maps because of this error message. Is there a solution for this issue out there? What file system format is supported for the new Garmin GPSMAP 66 series? Is it still Just FAT16/32? you have to use the non unicode version of the map. Your 66 does not support free unicode maps. Hi, bin schon lange fan und Unterstützer. Leider finde ich nach dem entpacken kein gmap file mehr. Von welchem Land? Kann aber im Prinzip nicht sein – nur bei der Europakarte hast du 2 (bzw mit Höhenlinien 3) downloads – die gmap ist nur einer der Downloads – die beiden anderen also kartendaten und Höhenlinien werden dann reinkopiert. Andere Möglichkeit – du hast vergessen dass du die .7z nicht mit dem Standard Mac OSx Entpacker entpacken kannst, besser keka oder “The Unarchiver” verwenden. Problem gelöst. Ich muss den ordner vom Map Manager aus auswählen. Ein Doppelklick geht nicht mehr. ah sorry, hab deine Frage falsch verstanden. Für Europe müssen die Kartendaten separat gedownloaded werden. Openmtbmap – Europe Mapfiles (MD5) (Unicode) .” falsch gesetzt ist? Vielen Dank für den Hinweis – ich habe es gerade korrigiert. Jetzt ist der Link unter “Standard – Karten in Landessprache” tot. Bei den englisch language maps funktioniert er korrekt. Ich nehme an, ich kann bei den kartendaten auch diese Version verwenden? Nein – du brauchst immer die passende Version – mixen geht nicht. 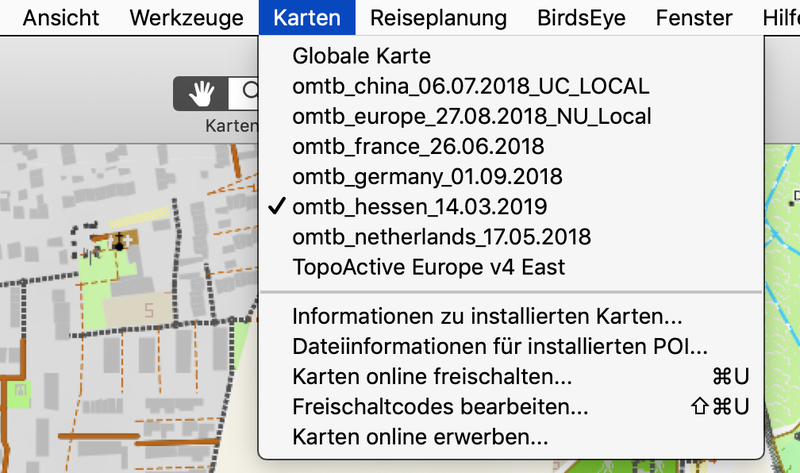 Sorry ich hab da beim kopieren in der deutschen und italienischen Version einen Fehler gebaut – ist jetzt korrigiert (und überprüft hatte ich nur die englischsprachige OpenMTBMap Website). I have a Garmin Etrex 30x, so I understand I have to download the ‘Non Unicode’ maps. But what about the Australia and Usa maps ? They seem not to be available as ‘Non Unicode’. Hi, after switching from metric to US and from US to metric back again, elevation is shown in meters. Thanks! Hi and thanks for your reply. There must be something different. I had already checked that option, and it is set to “metric”. Still, altitudes are in feet. That’s very strange. If you use another map – same problem? I’ve never seen this happen.